About this Bible: What if you had a trusted friend to guide you through God’s Word every day? 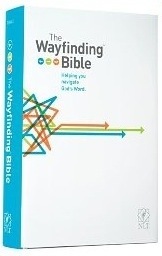 Whether you want a fast overview of the grand story of the Bible or a deeper exploration of the riches of Scripture, The Wayfinding Bible is that guide. I admit sometimes it feels like a chore to sit down and read my bible. After looking through this one I can say I enjoyed each session with the easy to follow path and extra insights and tidbits of information. I started out with the flyover then changed to scenic route. This is very well done and entertaining while staying true to His plan. It’s the whole Bible plus so much more. A definite worthwhile purchase. I received a free copy from the publisher in exchange for an honest unbiased review. View a trailer here about this book.